Almost 2,000 years ago, the Roman Emperor Hadrian cursed the Jewish People and decreed that "Judea" should be henceforth called "Palastina" after the Philistines, an ancient enemy of Israel that had disappeared from the world's stage more than 600 years earlier... It was his final twist of the knife and legacy after wars, massacres, persecutions and exiles that had largely extinguished the Jewish presence from Judea. The Arabs called it "Falastin" and today, the modern enemies of a resurrected Jewish Nation have dusted off Hadrian's curse and are attempting to pull off a monumental theft the Arab world have reincarnated - "Palestine" to steal Israel's heritage and the Land of the Jewish People. When the late Yasser Arafat declared; "Our nation is the Arabic nation that stretches from the Atlantic Ocean to the Red Sea and beyond it!" It turns out that Arafat's nation already stretches over an area larger than all of Europe. His is the twisted story of one of the biggest, most remarkable fraud in history. It is such a successful fabrication that many otherwise informed people have been duped and mislead. This propaganda has become a powerful weapon used by Israel's enemies, the Arabs, to try to conquer Israel without firing a shot - without an army, tanks or jets. But, the Jewish People eventually proved Hadrian wrong and the Bible true! They have returned to their land and re-established sovereignty over it. They have rebuilt Jerusalem as their capital, and have resettled desolate Judea! They did all this only to now confront the reincarnated curse of Hadrian in the disguise of Arabs renaming themselves the so-called "Palestinians" and then claim all the ancient Land as their own. In 1974, the late Syrian President, Hafez al-Assad, declared; "It would be fitting for us to mention to the responsible Israeli authorities that we view Palestine not just as an inseparable part of the Arab nation, but as a part of Southern Syria." In 1987, he reiterated himself at a conference in Amman, "A country named ‘Palestine’ has never existed!" Jordanian King Hussein responded; "The appearance of the national Palestinian persona serves as a response to Israel's claim that Palestine is Jewish." 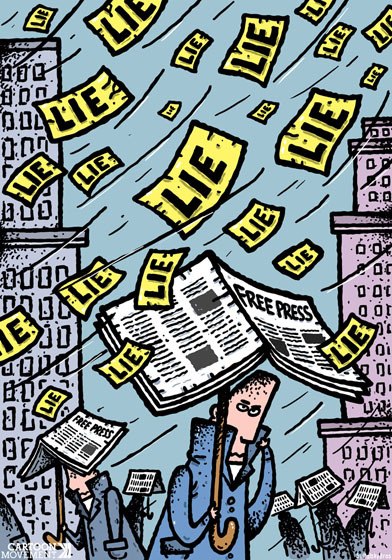 By means of brainwashing, fabrications, lies, falsification, and taking advantage of the world's ignorance and the international media's superficiality, a process has been taking place in broad daylight, for several dozen years already, of counterfeiting and blotting out history. 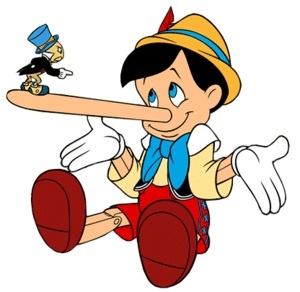 And just as Goebbels and Hitler, the arch propagandists of the 20th century said derisively… "The bigger the lie, the more people will believe in it!" 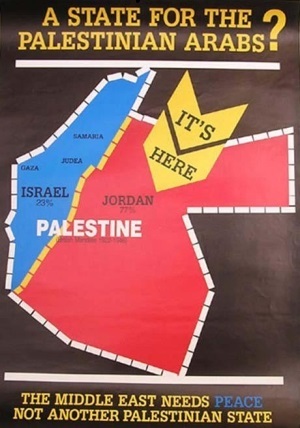 The Palestinian lie was NOT hatched by any land or any people …but by a MAP, a MAP drawn by two European colonial ministers, an Englishman, Herman Sykes, and a Frenchman, George Picot, and on the MAP was written; "Palestine!" It was clear to the British that "Palestine" as a sovereign political unit had never existed! No nation had ever borne its name! No people had ever prayed for its welfare! It was a name that hadn't existed at all for 1300 years, ironically, precisely when Muslim empires were dominant. "Palestine" was a Roman political fabrication that had faded and disappeared altogether with the empire that had created it! It's the twist of fate that for all this to happen, the Jews had to overcome Hadrian’s curse completely. They returned to their land - established sovereignty - resurrected the Hebrew language – established; a mighty army, industry, the best agriculture on earth, hi-tech, culture, song, dance – they re-established a nation - rebuilt Jerusalem as their capital and settled in every town and village that Hadrian had destroyed! Could Israel have possibly come full circle…? Will Hadrian’s curse that didn’t succeed for 2,000 years when Israel was exiled from their land, succeed today with Israel’s return to their Promised Land…? And, will it be the U.N., E.U. and Obama Administration that will resurrect Hadrian's curse, previously lost in the depths of forgetfulness…? Today thousands of years later the Palestinian Authority are calling for the fulfilment of what Hadrian failed to do …the erasure of Israel and the establishment of a Palestine State! The Emperor Hadrian must be smiling from the grave! The Middle East continues to dominate the media and this is because they have swallowed the modern lies and myth of a Palestinian State! Probably this is because this myth that Jews stole Palestinian cities, land and houses are taught to Palestinian Arab children from as young as toddlers at Nursery Schools. From one of the Palestinian Arabic School text books for Grade 12, we read, “Palestine’ (1948) war ended with a Nakba (catastrophe) that is un-precedent in history, when the Zionist gangs stole Palestine and expelled the people from their cities, their villages, their lands and their houses, and established the State of Israel.” These claims are false! Here are the facts…! There was no Arab State or nation called “Palestine” in the Middle East in 1948 – or ever! That means that there was no Palestine State or nation that the Jews could steal or occupy before 1948 or ever’...! Let’s look at some History…. The Ottoman Turks ruled the entire area from 1517 – 1917. During that time their where no independent states or nations within the Empire – just provinces. Though, the locations of the future states of Israel, Syria, Lebanon, Jordan, Iraq and others were created by the European powers by the end of the First World War out of the ruins of the Turkish Ottoman Empire. A homeland for Israel was one of the first created by the League of Nations (today is called the U.N. – or United Nations). The fact is that the Jews have been living continuously in Palestine (Israel) for 3700 years and since the 19th Century the Jews were a majority of the population in Jerusalem. Therefore, Israel’s claim is older than any other and its people have inhabited the land longer than any others. Israel had as much right to exist in the Middle East as do any of these Arab States. Jews are the most persecuted people of the face of the earth! They were victims of the ruthless Russian pogroms and in other Eastern Europe persecutions. The Nazi’s attempted to annihilate the entire Jewish race. More than 6 million - men, woman and children were murdered in cold blood. Haj Alamein Hussein - the leader of what we now know as the Palestinian’s, was in full co-operation with Adolph Hitler with his plan for the “final solution” plan for the Jewish people. They almost succeeded! It is interesting that in this great evil attempt to rid the world of the Jews many of those Jews could have been saved, if other nations in the West would have accepted them to immigrate! But, at the San Remo Conference in 1922, the League of Nations (U.N.) gave Britain a mandate to create a homeland for the Jews. A substantial portion of the land encompassing modern Jordan and Israel at the eastern end of the Mediterranean Sea was designated as the Palestine Mandate. It was to be a secure final homeland for the Jewish people but the Arabs benefitted most from this Mandate as it turned out! In 1922 as British Colonial Secretary, Winston Churchill gave Trans-Jordan to the Hashemite’s. Let’s try to explain this… the Hashemite’s were the guardians and custodians of the holy places in Mecca and Medina for many centuries. They helped somewhat in the war effort in World War 1. So, when they appealed to Winston Churchill’s department that they should be rewarded as “helpers” by giving them a “homeland” he then gave them “Transjordan” and the Hashemite’s as we now know them as “Jordanians” were driven from their position as the guardians of the holy sites by the Saudi’s. Jewish Leader, Chaim Weizmann, then agreed to give 80% of the Jewish Palestine Mandate Land to the Hashemite’s. 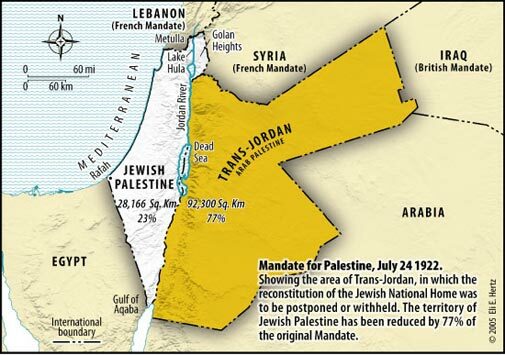 This was in exchange that the Jews would receive a written agreement that “Trans-Jordan” would be made a home - for those displaced Arabs that lived in Palestine Mandate territory. The agreement was signed by Emir Feisal representing the Arab Kingdom of the Hajars on the holy sites around the great territory of Mecca and Medina on the 03rd January, 1919. In this document Emir Feisal promised that there would be no more demands upon the Jews by the Arabs if they were given this land. Today, the Kingdom of Jordan which is at least 83% Palestinian is supposed to be the Palestinian State …but it is not acceptable! What did the Muslims do with the West bank and Gaza…? They were given billions of dollars from the United States and the United Nations and Europe and their Jewish neighbours and this was for economic development but virtually all of it was taken by the PLO and other terrorist organizations that used the money for weapons and terrorist attacks against Israel and the rest went into Swiss Bank accounts of the corrupt Palestinian leadership. No infrastructure for a State has ever been built! For the first time in 2,000 years the Jews have a State of their own, Israel, though it represents only 1/6 of 1 % of the Middle East… That was unacceptable to the Muslims, instead Hassan al Banna the founder of the Muslim Brotherhood, said in 1948; “If the Jewish State becomes a fact (the Arabs) will drive the Jews who live in their midst (into) the Sea!” When the Jews had virtually no land the Muslims vowed to destroy them and drive them into the Sea. 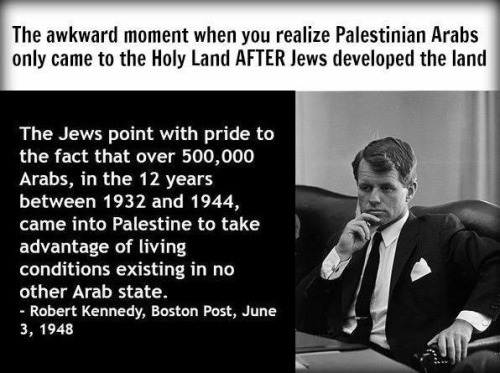 So why should they believe that the Arabs would not seek to destroy the remainder of Modern day Israel if they give them back the same land they had in 1948…? The Middle East war is not about land! The Muslim justify their war against Israel by saying that the Jews stole their land and then occupied it. The facts prove that these claims are false! On May 15th, 1948, the day after Israel declared “Statehood,” five surrounding Muslim nations simultaneously attacked the infant Jewish State. The attacking Arab governments urged the Arabs in the new Nation of Israel to flee their homes. They promised to butcher the Jews in a few weeks and then the refugees could return to their homes and claim the booty that was left. 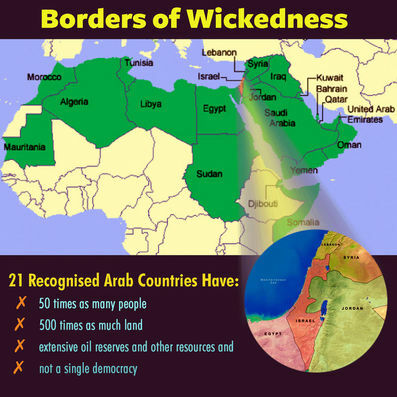 But, the surrounding Arab nations failed to make good on their promises and “against all odds” the Jews held them off! Mahmoud Abbas the president of the Palestinian Authority wrote in the “Falastin al Thawra” - official journal of the PLO in Beirut in 1976; “When the Arab armies entered Palestine to protect the Palestinian’s from the Zionist tyranny, but instead they abandoned them, forced them to emigrate and to leave their homeland, and oppose upon them a political and ideological blockade and threw them into prisons similar to the ghettos in which Jews used to live in Eastern Europe.” The ironic fact is that almost a million Arabs remained and did not leave and today these Arabs have more freedom as full Israeli citizens than their fellow Arabs in any Muslim country. If, as Jimmy Carter, who claims to be a Bible believing Christian and his liberal cohorts claim that, “the Jews are ruthless occupiers and thieves” …then why do the Israeli Arabs have more rights than Arabs in Muslim States…? Abbas’s statement rings out a grossly ignorant fact! The Muslims are more barbaric towards each other than any other people! They have treated the Palestinian refugees more ruthlessly than Israel ever would or has. For the most part they refuse to accept them and give them full citizenship. 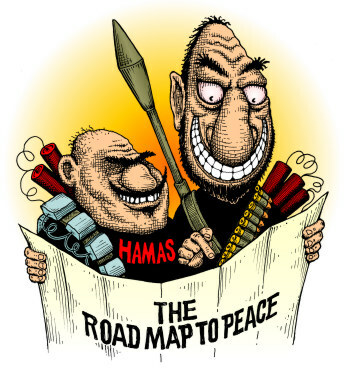 They are simply “pawns” in the bigger picture of Arab and Muslim nations wanting to destroy Israel! They deliberately kept them in concentration camps in order to fan their fires of hatred for the Jews! Back in the 70’s, Jordan’s King Hussein, stopped the Palestinian revolt by turning artillery fire on Palestinian refugee camps filled with woman and children. Much the same has happened in Lebanon recently. It was called the “black September” event. Remember, the barbarity of Saddam Hussein, toward Iran in their nearly 10-year war! He used chemical weapons against them and the Ayatollah Khomeini sent young boys in the mine fields to clear the way for his troops in their battle against Iraq. The Muslim World conveniently sweep these things under the table! It’s only the alleged Jewish mistreatment that they feature to the bias media! Its transparently done for propaganda purposes to win Western support for their cause and the Liberal Western Media buys it - “hook, line and sinker!” The Middle East war is NOT about refugees. When Israel became a State in 1948 - 850,000 Jews were forced to flee Muslim countries with only the clothes on their backs. Many of these Jews were from communities that existed for thousands of years but you never hear about the Jews refugee problem because the Israeli’s resettled them in Israel! In contrast the Muslims put their displaced Arabs into concentration camps and to this day they have never accept them, assimilate them or offer them citizenship! Yet Israel extended full citizenship to the Arabs that stayed and the Jews are not welcome in most Arab countries today. The Palestinian cause is not about self-determination… Muslims and their useful idiots of the West claim that the Middle East is a constant conflict because the Palestinian’s yearn for a State …and Israel refuses to give it to them! Both of these claims are false! The Palestinians were offered statehood in 1948 and again in 2000 …and both times they responded with armed aggression and terrorist attacks! From 1948 to 1967 Egypt possessed Gaza and Jordan possessed the West Bank. Why did they not offer that land to their fellow Arabs and Palestinians as a state? It’s the same land that they now want Israel to give them! Perhaps the Egyptians and the Jordanians know something we don’t…? The Middle East crisis is really about the annihilation of Israel and the Jews! According to the Muslim propaganda machine the cause of the Middle East conflict is the Israeli occupation of Arab land. This too – is false! In 2000, Israel withdrew in forces from Southern Lebanon which they had occupied to stop terrorist rocket attacks on Israeli towns in the North. Hezbollah and Hamas immediately started launching missiles supplied by Iran against Israeli civilians in Northern Israel. In 2005, with intense pressure from then US President George Bush, Israel withdrew its military forces from Gaza which they had occupied to prevent terrorist attacks. As soon as Israel withdrew and forcibly removed the Jewish settlements from Gaza, Hamas began launching rockets against towns and schools inside Southern Israel! But, these terrorists were not a rogue element, they were members of Hamas and the vast majority of Palestinians voted for them in the last few elections and gave them control of the Palestinian government and surveys show that they would do it again! Should aging and ailing Abbas pass away you can be sure that Hamas will take over the West Bank! If the Palestinians have immediately and relentlessly attacked Israel from Gaza and Lebanon when the Israeli’s gave them that land …why does anyone think that they will not do the same if Israel gave then the West Bank and the Golan Heights…? The Muslims openly declare their goal so why doesn’t the US and the West listen and believe them…? At the "World without Zionism" Conference in 2005, the then Iranian President Mahmoud Ahmadinejad declared, "As the Imam (Ayatollah Khomeini) said Israel must be wiped off the map… The Islamic community will not allow its historic enemy to live in the heartland. Anyone who signs a treaty that recognizes the entity of Israel means that he has signed the surrender of the Muslim world!" At a later public conference he said, "Like it or not, the Zionist regime is heading toward annihilation. The Zionist regime is a rotten, dried tree that will be eliminated by one storm." Hezbollah leader Hassan Nasrallah is even - more blunt and at various times he has said, "The Jews are a cancer which is liable to spread again at any moment. There is no solution to the conflict except with the disappearance of Israel. If they all gather in Israel, it will save us the trouble of going after them worldwide!" Let’s look at this Biblical example… Israel's greatest King Solomon, was only twelve years old (1 Kings 2:2-3; 3 7-13) when God promised him that he would be granted wisdom, and that he would be the wisest man that ever lived! In the very first recorded decision in the history of legal justice, in 1 Kings 3:16-28 …we read about Solomon’s brilliance and how it made him highly regarded at such a tender age to the entire nation of Israel, who willingly accepted him as their ruler. Two women came before King Solomon... One woman (the true mother) said, "My lord, this woman and I dwell in the same house and I gave birth to a child while she was in the house. On the third day after I gave birth she also gave birth… This woman's child died during the night because she lay on him. She arose during the night and took my son from my side while I slept, laid him on her bosom and laid her dead child on my bosom. When I rose in the morning to nurse my son, behold, he was dead! But when I observed him in the morning, I realized that he was not my son to whom I had given birth." The other woman replied; "It is not so! My son is the live one and your son is the dead one." 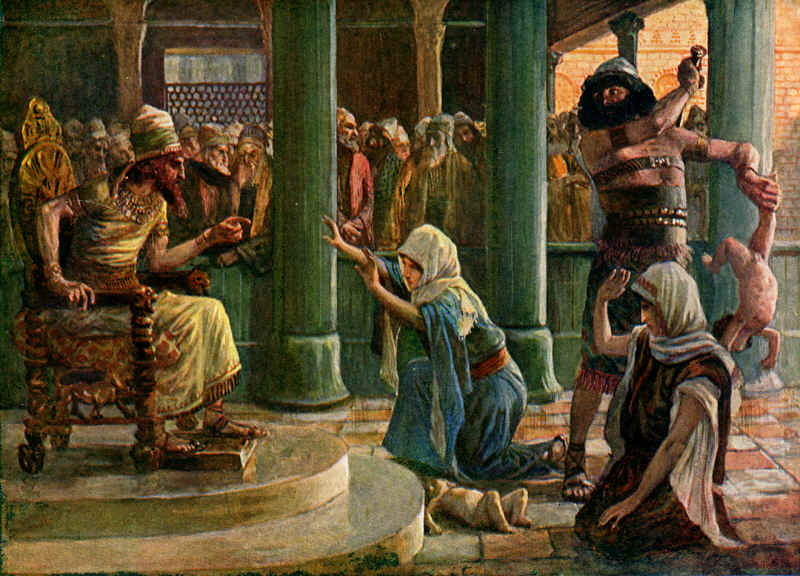 King Solomon briefly listened to their arguments and ordered… "Bring me a sword!" The King then said; "Cut the living child in two, and give half to one and half to the other." The woman who claimed that her son was stolen from her said, "Please, my lord, give her the living child and do not kill it!" But the other woman said… "Neither mine nor yours shall he be! Cut!" The king spoke up and said, "Give the first woman the living child and do not kill it - for she is his mother!" Is it possible that King Solomon in his divinely inspired wisdom was thinking of the widely celebrated and the internationally acclaimed dispute over the Holy Land, where the two mothers, the Jews and the Arabs, are arguing over the same piece of land…? It is fascinating to note that this case is the one and only example the Bible gives us of King Solomon's legendary brilliance. The issue is about who cares about the baby! It's all about life! The true mother wants the baby to live, while the false mother would gladly see the baby die! The US Obama Administration, EU, UN and international community has been unanimous in its decision to bring on the sword, to cut the baby in half and to divide the Holy Land. Just as in the story of these two mothers, everyone supporting a so-called Palestinian State their true colour will emerge for all to see! The true mother, the Jewish people who love the land, who have a soul connection to the land, who for thousands of years prayed and continue to pray every day … “Please God return me to the land,” have relinquished their just claim. For the sake of peace, Jews are ready to make painful concessions. Give the baby away rather than hurt the child, they cry out! The false mother, the Arabs, however, who never wanted the baby in the first place, and only wanted to deprive the real mother of her legitimate child, cruelly declare … “If I won’t get the baby than kill the baby!” The Arabs say that if they don’t get Jerusalem and the Jews refuse to unconditionally surrender to them, they will destroy the land, maim and murder its inhabitants and strangle Israel’s economy. How quickly everyone has forgotten the searing images during the Gulf War, how the Arab settlers in Arab-occupied Ramallah danced on the roof tops encouraging their hero, Sadaam Hussein, to rain missiles on Israel and to destroy the entire land…? The verdict is in by the most brilliant legal mind that ever lived. The Jewish people are the real mothers; Israel is their baby and the land is exclusively Jewish… Even when they were forcibly exiled from their land by their oppressors, the Jewish soul never went into exile and the Jewish people never ceased yearning for Israel. “Next Year in Jerusalem!” they cried out, as they physically turned their faces towards Jerusalem each and every time they prayed. The Arabs, however, have NO connection to the land of Israel... They are usurpers who have, by and large, migrated to Israel over the past 100 years because of economic opportunities made possible by the Jews. Jerusalem is not mentioned even once in their Quran, while it is mentioned close to a thousand times in the Bible. When Islam was born 1,600 years ago in Mecca and Medina, the Jewish people had already been in the land of Israel for close to two thousand years and went through two Temples and two Commonwealths. The classical Biblical commentaries are puzzled…. Why was King Solomon so confident that the false mother would reveal her treachery by agreeing to literally cut the baby in half…? After all, wouldn’t human compassion have compelled her to spare the baby, to have mercy on the child and forego her claim so the baby could live…? Mothers throughout the world naturally love their children more dearly than life itself, and would not let harm befall their children. Surely, a mother couldn't harm her new-born baby, even in her sleep. It’s a fact that billions of mother’s sleep with their infants without crushing them. The false mother crushing her own baby to death proved that, as the exception to the rule, she was sorely lacking in motherly instincts and was inclined towards cruelty! There's another puzzling mystery… When the real mother agreed to give up her baby why didn’t the lying false mother accept the offer…? Why did she insist that the baby be cut in half…? After all, didn’t she kidnap the baby in the first place because she wanted to have a baby…? King Solomon, in his brilliance, realized that she stole the baby NOT out of love for the child - but out of jealousy for the real mother! Surely, if she had NO love for her own child and was able to smother her own baby to death, she wouldn’t then care about a stranger's child. It was a purely vindictive act to deprive the real mother of her child! Consequently, killing the baby by cutting the baby in half, thereby depriving the true mother of her baby, would suit her just fine. Arab mothers who send their own children to die - kill Jews and then celebrate their horrific murderous deaths and suicide missions as martyrdom simply expose the truth that Palestinian Arabs are the true thieves, murderers and occupiers! This may seem harsh but it is how Hamas and Abbas’ PLO celebrate when Jews are murdered or injured in Israel by terrorist attacks and even hand out sweets to passer-by cars and pedestrians in Arab occupied towns and villages. While the true mother, Israel, agreed to give the land away for the chance of peace …the Arabs prefer to have the baby killed! In response to Jewish overtures for peace, the Arabs unleashed the most vicious and murderous suicide attacks, unprecedented in human history, against innocent men, women, children and babies, attempting in vain to destroy beautiful Israel! We are today seeing fulfilled what God predicted would happen with the Covenant that He made with Abraham and his sons Isaac and Jacob. In Genesis 17:21 God said to Abraham that His Covenant would be established with Isaac whom Sarah will bear to you this season next year. Then when Jacob was born to Isaac the Covenant was re-confirmed in Genesis 28:1. This was reconfirmed many times in the Scripture and what this does it makes Israel the only nation on this earth that the Creator has given the title deed to a specific land. 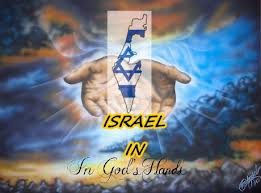 Israel has a title deed from God Himself! No other nation on earth has a title deed from God! But, Israel does! This sets up a great historical dilemma because Moses in Deuteronomy 28 as Israel was coming from Egypt and was delivered miraculously by God to the Promised Land. God said that they would be destroyed twice in their future. He predicted it would be because of their unbelief and when He speaks of the Second Dispersion in Deuteronomy 28:64 that they shall find no rest. Twice Israel was destroyed. Once by the Babylonians in 587 BC and the Second time by the Romans in 70AD and just as predicted the second time the Jews were scattered around the world for a long time. But then Prophecy predicts that God would bring them back! As a matter of fact, in Ezekiel 36, it tells us that the main enemies of Israel will be the descendants of the half-brother of Isaac which is Ishmael and the twin brother of Jacob which is Esau! These two people groups (Ishmael and Esau) would gather together to what we now know as the Arabs …and EDOM is the common name that was given to the combined race now called the Arabs! This is what Ezekiel predicts about the Last Days just before the Messiah would come to set up the Promised Kingdom. He says in Ezekiel 36:2-8 - that the world wide dispersion of the Jews would be brought back to the Land of Israel …and a miraculous birth would take place. But, God makes it very clear why He is doing this in Ezekiel 36:19-24 - not for their sake but for His Holy Name …His great Name! We have witnessed that in 1948 when this was officially beginning to be fulfilled! We believe that God is holding up His Word whether the world likes it or not! He is going to fulfil it just as He promised …and the remnant of the Jewish people who believe in the Messiah, Yeshua (Jesus), and He is going to rescue them and He is going to do it with a great war! It is this ancient conflict between the half-brother and the twin brother of Isaac and Jacob that this feud and this Arab – Muslim hatred is going to touch off the last great war of the world called - Armageddon. We are living in those days and we believe it’s happening before our eyes. The significance is that the Word of God is being “proved” true before our very eyes and each day we all have to work with fear and trembling on our own salvation! Now let’s look at what is a Biblical Covenant…? A covenant is an agreement between two parties. There are two basic types of covenants; conditional and unconditional. A “conditional or bilateral covenant” is an agreement that is binding on both parties for its fulfilment. Both parties agree to fulfil certain conditions. If either party fails to meet their responsibilities, the covenant is broken and neither party has to fulfil the expectations of the covenant. An “unconditional or unilateral covenant” is an agreement between two parties, but only one of the two parties has to do something. Nothing is required of the other party. 1. The promise of land (Genesis 12:1) … God called Abraham from Ur of the Chaldees to a land that He would give him (and this promise is repeated in Genesis 13:14-18 where it is confirmed by a shoe covenant; its dimensions are given in Genesis 15:18-21. The land aspect of the Abrahamic Covenant is expanded in Deuteronomy 30:1-10. 2. The promise of descendants (Genesis 12:2) ... God promised Abraham that He would make a great nation out of him. Abraham, who was 75 years old and childless (Genesis 12:4) - was promised many descendants! This promise is amplified in Genesis 17:6 where God promised that nations and kings would descend from the aged patriarch. This promise (which is expanded in the Davidic Covenant of 2 Samuel 7:12-16 would come to pass in the Davidic throne …with Messiah’s Kingdom rule over the Jewish people. 3. The promise of blessing and redemption (Genesis 12:3) … God promised to bless Abraham and the families of the earth through him. This promise is amplified in the New Covenant (Jeremiah 31:31-34 and Hebrews 8:6-13) and has to do with “Israel’s spiritual blessing and redemption.” Jeremiah 31:34 anticipates the forgiveness of sin. The unconditional and eternal nature of the covenant is seen in that the covenant is reaffirmed to Isaac (Genesis 21:12; 26:3-4). The “I will” promises once again suggest the unconditional aspect of the covenant which is later confirmed to Jacob (Genesis 28:14-15). It is important to note that God re-affirmed these promises amid the sins of the patriarchs which further emphasis the unconditional nature of God’s – Abrahamic Covenant! God’s method of fulfilling the Abrahamic Covenant is literal - inasmuch as God partially fulfilled the covenant in history: God blessed Abraham by giving him the land (Genesis 13:14-17) and centuries later the sons of Abraham through Isaac, took control of the land; “So the Lord gave Israel all the land he had sworn to give their ancestors, and they took possession of it and settled there,” Joshua 21:43. God blessed Abraham spiritually (Genesis 13:8, 18; 14:22, 23; 21:22). God gave him numerous descendants (Genesis 22:17; 49:3-28). An important element of the Abrahamic Covenant, however, demands a still-future fulfilment with the Messiah’s Kingdom rule; (1) Israel as a nation will possess the totality of the land in the future… Numerous Old Testament passages anticipate the future blessing of Israel and her possession of the land as promised to Abraham. Ezekiel envisions a future day when Israel is restored to the land (Ezekiel 20:33-37, 40-42; 36:1-37). (2) Israel as a nation will be given a new heart, forgiven, and restored (Romans 11:25-27). (3) Israel will repent and receive the forgiveness of God in the future (Zechariah 12:10-14). The Abrahamic Covenant finds its ultimate fulfilment in connection with the return of Messiah to rescue and bless His people Israel. 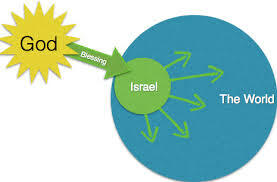 It is through the nation Israel that God promised in Genesis 12:1-3 to bless the nations of the world. That ultimate blessing will issue in the forgiveness of sins and Messiah’s Glorious Kingdom reign on earth. Maranatha Lord!